If you happen to be in London today—Wednesday, October 17—and in the market for a life-size and life(? )-like replica of Kate Moss’s face made entirely of gold, boy, do I have some good new for you. Sotheby’s is holding an all-gold auction, its first ever, and if I were to attend, my first ever, too. Among the items being auctioned off are 1977 Ferrari (painted gold), bedsheets (40 percent gold), and a bottle of Dom Pérignon (bottle is gold, unclear if the champagne has gold in it). 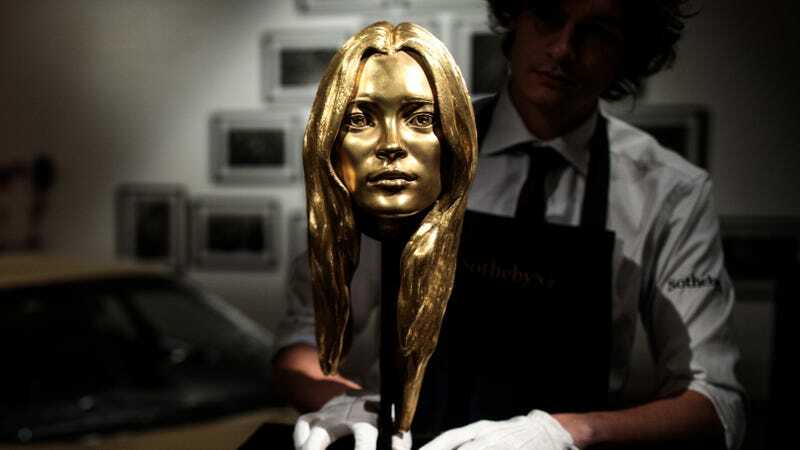 That includes this 18-karat gold bust of Kate Moss, which starts at $300,000, according to NBC News. Would you like it? Maybe for your living room. I think it’d look nice next to like, a large potted plant. I hear gold accents are really in right now, or I didn’t hear that, but that’s the impression I get from Instagram. Yeah, I was thinking about getting it, but then, I dunno, I changed my mind. But you should get it! Yeah! Yeah, no, I’ll just keep looking. No stress. If this is not to your liking, or you find gold too gauche, the artist behind the Kate Moss bust, Marc Quinn, has some other Kate Moss-inspired art that might interest you.